If you are looking for a dependable refrigerator technician Vaughan team, you have come to the right place. Our company is a trusted source for any refrigerator related service you may need. We are available for same day appointments all over the Vaughan region in Ontario, and can quickly resolve any type of problem. 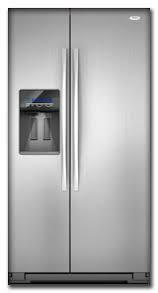 All you have you to do is to give us a call and we will dispatch our qualified refrigerator technicians in a jiffy. Is your refrigerator not cooling properly? Or the freezer won’t freeze? Don’t panic and call Appliance Repair Vaughan for a quick and reliable repair service.Our team has been servicing refrigerators for a long time and learned every single detail about their operation. Whether it’s a minor refrigerator repair or a complete replacement, our skilled specialists will handle the task in the most professional manner. We are trained to work on nearly all makes and models available these days. No matter if it’s a brand new or twenty-years-old appliance, you can count on us. By having the right tools and a good number of common replacement parts in our service trucks, we can perform same day fridge repairs in most of cases. Call us today and we’ll be there within a short notice. When it comes to kitchen appliances, a refrigerator is definitely among the most important ones. If you are looking for the ways to increase the efficiency and prolong its lifespan, turn to our company. As professionals, we know the right methods to keep your unit up and running all the time. By hiring us to service your fridge once or twice a year, you will be able to avoid unexpected breakdowns and costly repairs in the future. Anytime you face a problem with your refrigerator, our team of qualified refrigerator technicians of Vaughan is at your service. From repair and replacement to installation and maintenance, we can complete any task to your absolute satisfaction!